Chávez to Iran: How About Some Uranium? When Venezuela's Mining Minister Rodolfo Sanz walked into a televised Cabinet meeting this week, President Hugo Chávez impishly asked, "So how's the uranium for Iran going? For the atomic bomb." 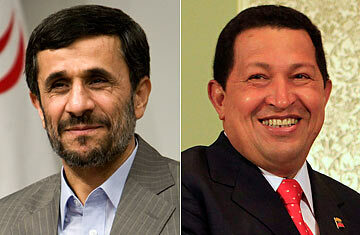 Chávez was joking, but few were laughing outside Caracas and Tehran. Ever since Chávez announced last month that he was seeking Russia's help to develop nuclear energy in Venezuela  and especially since Sanz turned heads a couple of weeks ago by disclosing that Iran is helping Venezuela locate its own uranium reserves  the South American nation and its socialist, anti-U.S. government have become a new focus of anxiety over regional if not global security. But how big a concern should Venezuela be? Chávez delights in getting a rise out of the U.S., and his alliance with Iran and President Mahmoud Ahmadinejad is largely a calculated affront to Washington  his version of Cuba's Cold War partnership with the Soviet Union. It's little coincidence that Sanz made his announcement the same day the U.S. and its allies called Iran on the existence of a secret nuclear-fuel plant near the Iranian city of Qum. The U.S. and the U.N.'s International Atomic Energy Agency (IAEA) fear that Iran is on the verge of bolting the global Nuclear Non-Proliferation Treaty and developing not just nuclear energy but a nuclear weapon, a charge Tehran denies. Venezuela's ties to the Islamic Republic, as a result, have taken on dimensions beyond just tweaking Uncle Sam's nose. That suits Chávez's fondness for the international spotlight. Still, security experts say he's flirting with something more serious than anti-yanqui bravado. Chávez, who recently agreed to sell Iran 20,000 barrels of gasoline a day, backs the country's claim that it's enriching uranium only for peaceful purposes. But if the international community decides Iran is making an atomic bomb  something IAEA inspections may determine later this month  it would complicate any Venezuelan plans to export uranium to the country, since it would be widely viewed as aiding and abetting a rogue nuclear-weapons program. "In that event, the world is watching whether Venezuela seems poised to cross any international legal boundaries," says Johanna Mendelson Forman, a senior associate for the Americas at the Center for Strategic and International Studies in Washington, D.C. "But it's still too early to tell what Venezuela is really doing." A recent intelligence report put out by the government of Israel, which considers Iran's nuclear program a direct threat to its security, said Venezuela was already supplying Iran with uranium. But experts say it's hardly certain Venezuela even has much, if any, uranium to provide Iran or anyone else. Officials there have long estimated the country is sitting on 50,000 tons of the radioactive ore, concentrated mostly in western Venezuela and in the Roraima Basin along the country's southeastern border with Brazil and Guyana. (The U.S. has uranium reserves of about 340,000 tons.) It may be high grade, says James Otton, a uranium-resources specialist at the federal U.S. Geological Survey, a reference not to its quality but to the "tremendous quantities of uranium in a given volume of rock" found in places similar to Roraima, a virtual Lost World of Precambrian geology. But those jungle conditions make extracting the ore, if it's there, difficult. "And there is still no publicly available information that uranium has ever occurred in Venezuela," says Otton. "Right now it's just potential." Robert Rich, a Denver-based uranium expert, agrees: "Chávez can claim the geology indicates they might discover it there, but as a scientist I'd say there's not much to it yet." Sanz, however, insists that Iranian experts have concluded Venezuela "has a lot of uranium." If so, the other big question is whether Venezuela itself will really pursue a nuclear-energy program. Like oil-rich Iran, it's hardly in urgent need of nuclear power: Venezuela has the western hemisphere's largest crude reserves, and 75% of its electricity is hydro-generated. It abandoned its one test nuclear reactor 15 years ago. Still, Chávez says the country needs alternatives, and has struck a deal to receive nuclear-fuel-technology aid from Russia, Venezuela's top arms supplier. "We're not going to make an atomic bomb," Chávez said after announcing the Russia agreement, "so don't bother us the way you're bothering Iran." Experts say it could take Venezuela's less-than-stellar science infrastructure more than a decade to develop a nuclear-power industry, let alone a nuclear bomb. (Only Brazil, Argentina and Mexico produce nuclear power in the region.) What's more, Venezuela is a signatory to the 1967 Tlatelolco Treaty, which prohibits the development of nuclear weapons in Latin America. Even so, says Mendelson, "the U.S. is worried that Venezuela has become a platform for the entrance of Iranian mischief in the hemisphere." If Iran is building a bomb, she adds, the U.S. may well assume that Tehran is interested in slipping that technology to Venezuela as well. All that is speculation at this point, of course, and Venezuela would face isolation not just from the U.S. but from its Latin trade partners  especially Brazil, which is campaigning for a permanent seat on the U.N. Security Council  if it were to ever toy with nuclear weaponry. As it is, Chávez can look forward to stepped-up global pressure if Iran, like North Korea, is eventually found to be pursuing a nuclear bomb, especially if international economic sanctions are imposed on Tehran. If that happens, Chávez has indicated he'll ignore the measures and keep supplying the 20,000 barrels per day of gasoline to Iran, which has to import almost half its gasoline because of a lack of refineries. Then again, it's uncertain if powers like Russia and China, which sell even larger quantities of gasoline to Iran, would take part in U.S.-led sanctions themselves. Their postures are a reminder that when it comes to thwarting Iran's nuclear ambitions, Venezuela may be a small concern in comparison. But given the tensions involved at the moment, few besides Chávez are finding humor in it.